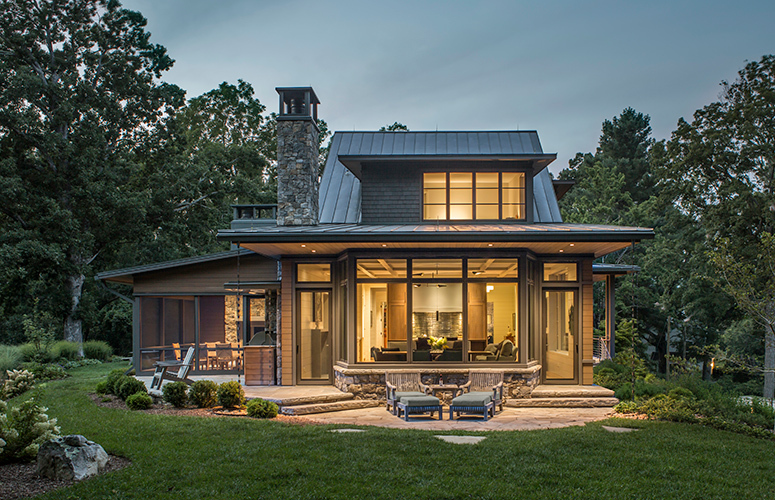 The Twin Oaks Residence is located in a quiet North Asheville neighborhood and is named after two towering oaks that stand at the southern end of the lawn. The trees have long been a part of the landscape and we knew we had to design the home in deference to the oaks. The home, although new in construction, speaks to the past and tells the story of the property it sits on. 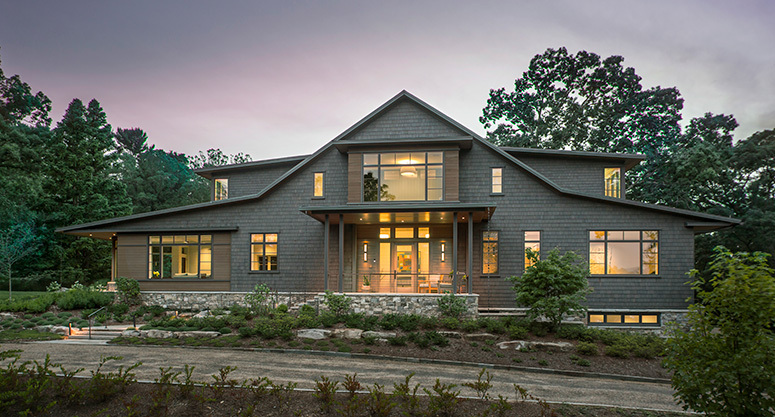 We wanted the house to fit the character of the surrounding area, so the exterior massing is an interpreted shingle style home, which is historically prevalent in North Asheville’s old streetcar neighborhoods. The contour of the home follows the ridge, reaching an apex along an east-west axis at the front entry. The home’s living and eating spaces extrude from the lawn’s north end to perfectly align with the trees, while the garage is tucked under and out of sight on the opposite side. Details, such as deep cantilevered eaves provide the appropriate shade year-round. Darker exterior materials and colors allow for the house to recede better into the wooded landscape. On the inside, the light and bright aesthetic provides a gallery-like backdrop to artwork. Clean lines and neutral materials bring focus to the owner’s collection of antique furniture and folk art. 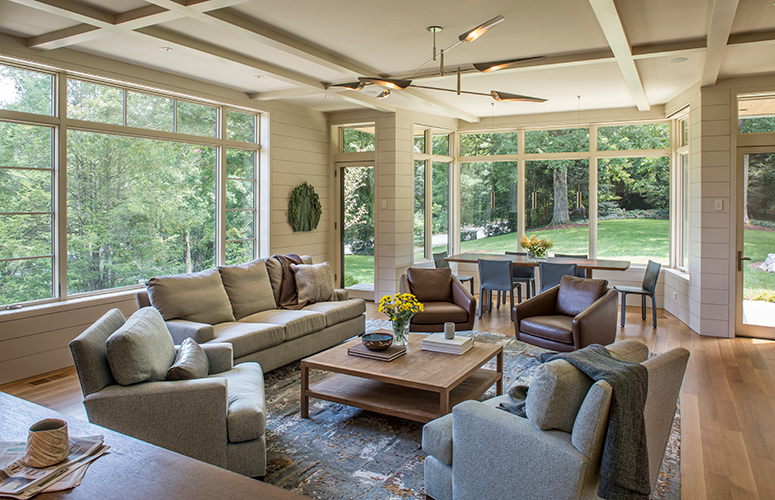 The main level holds a great room, a screened porch, owners suite and library. Upstairs are guest rooms and an office space. Above: The great room holds dining, living and kitchen with views framed in the generous windows. 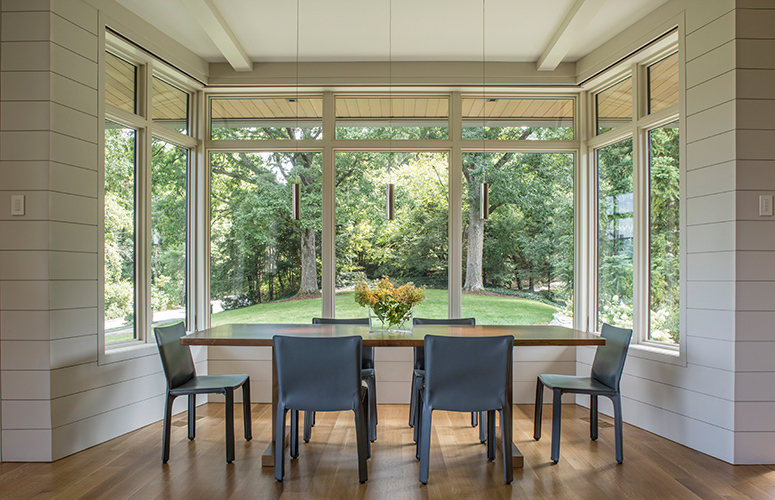 Above: Simple furnishings and lighting makes the dining area all about the view of those beautiful oak trees. Above: Darker materials are used in the kitchen to help anchor the great room and provide contrast with the white walls and ceilings. Above: The front entry is a pleasant mix of old and new with a surprise pop of color when the powder room is revealed. 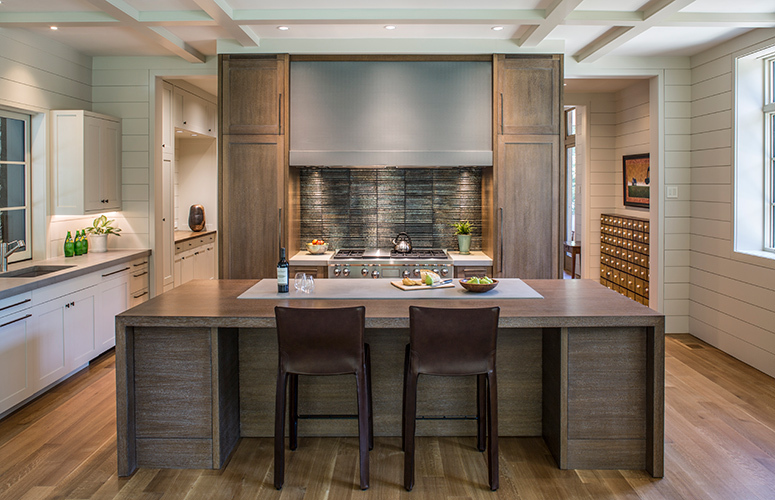 This home is a successful collaboration with our clients, Tyner Construction and Alchemy Design Studio. To see more photos of this home, click here.